The Iowa Application for Certificate of Authority (NonProfit) | Form 635_0106 should be filed with the Iowa Secretary of State when a foreign nonprofit corporation has the intent of conducting its affairs as a nonprofit corporation in the State of Iowa. 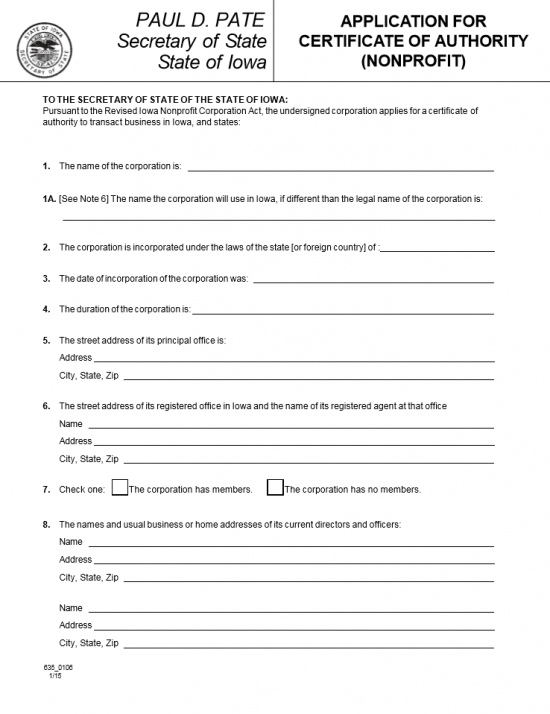 This application form will organize the basic information that a foreign nonprofit corporation must deliver to the Iowa Secretary of State. While all nonprofits must submit this form, quite a few will need to add specific information or even file other documents with the Iowa Secretary of State and/or other governing entities. It is left up to the filing entity to make sure it is fully in compliance with Iowa statutes regarding this matter and it is encouraged to take the initiative in fulfilling all this state’s requirements. The Iowa Application for Certificate of Authority (NonProfit) | Form 635-0106 will need to be packaged with all required documents for this filing, including a Certificate of Existence from the Secretary of State of the foreign corporation’s home state and a full payment for the $25.00 Filing Fee. If filing by mail and paying by check, it must be made payable to Secretary of State. If submitting through the website you may remit payment using your account or using a credit card (Visa, MasterCard, Discover). You may mail to Secretary of State, First Floor, Lucas Building, 321 E. 12th St.,Des Moines, IA 50319 or submit through the Iowa Secretary of State website (https://sos.iowa.gov/file/origination/index.aspx). 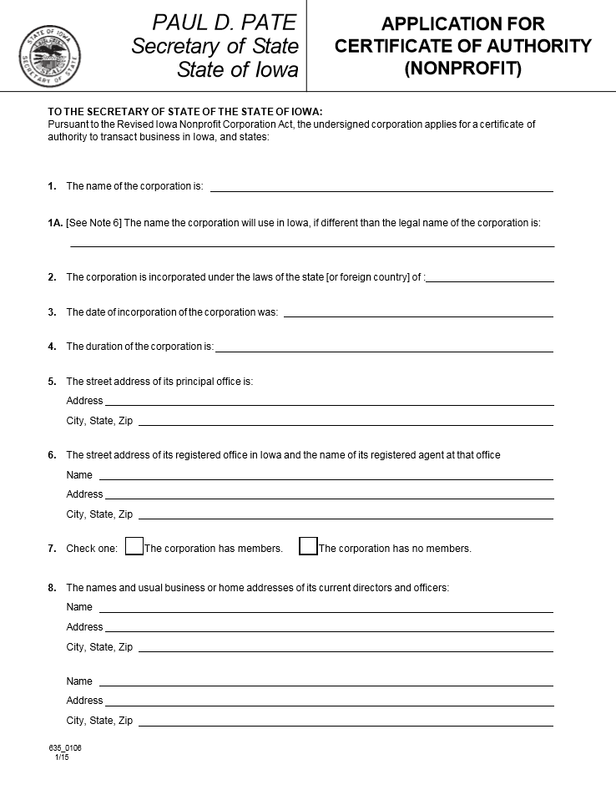 Step 2 - In Item 1 enter the True Full Name of the foreign nonprofit corporation seeking a Certificate of Authority. If the Name is taken in this state or if it is not compliant, then enter the Fictitious Name the foreign entity will adopt to operate under in this state. Note: This must be accompanied by a Resolution, to operate under the Fictitious Name, that is issued from the Board of Directors and certified by the Secretary. Step 3 - Item 2 will need the location where the foreign nonprofit corporation is incorporated entered on the available space. That is, what is the home state of this corporation. Then in Item 3, enter the Date the foreign nonprofit corporation incorporated in its home state on the blank space provided. Step 4 - Define the lifespan of the foreign corporation in Item 4. If this corporation will operate with no intent of dissolving then enter the word “Perpetual.” If there is a Dissolution Date, it must be reported here on the blank line provided. Step 5 - Report the actual location of the Principal Office on the blank lines in Item 5. The first blank line will require the Building Number, Street, and Suite Number while the second line is for the City, State, and Zip Code. Step 6 - In Item 6, report the Registered Agent’s Full Name on the first line. Then enter the Address of the geographic location of the Registered Office on the second and third lines. Step 7 - Item 7 will have two check boxes. You may choose one. If the foreign corporation has members then place a check mark in the first box. If the corporation does not have members then place a check mark in the second box. Step 8 - Next, in Item 8, report the Full Name and Full Address of the current Officers and Directors of this corporation in the spaces provided. There is enough space to report four parties however if there are more this listing should be continued on a separate clearly labeled document then attached. Step 9 - Item 9 will require you attach a Certificate of Existence or Good Standing issued, within the past ninety days of the application date, by the Secretary or State or Custodian of Records of the foreign nonprofit corporation’s home state. 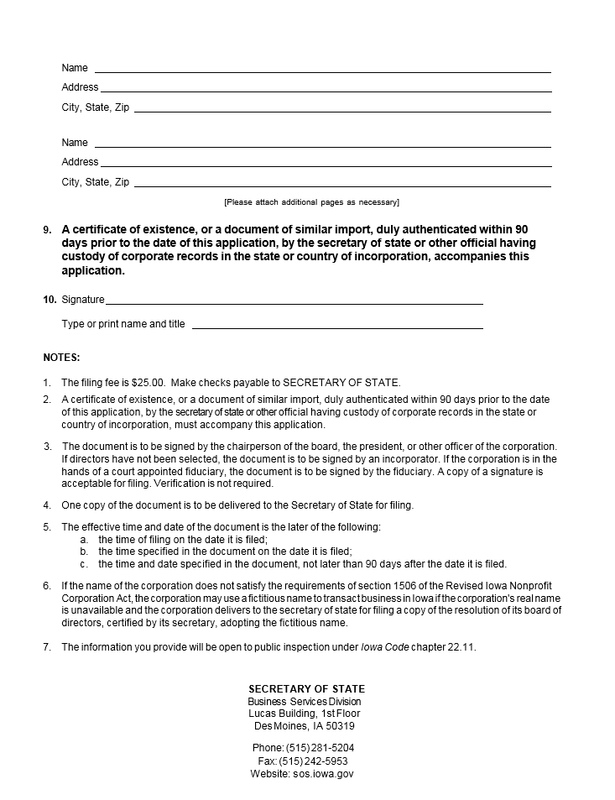 Step 10 - An Authorized Representative of the foreign nonprofit corporation (such as a Director or Officer) must sign his or her Name on the Signature Line in Item 10. Below this, the Authorized Representative must Print his or her Name and Title held with the foreign nonprofit corporation. Step 11 - Gather all required documents with the Iowa Application for Certificate of Authority (NonProfit)| Form 635_0106. Make sure that all these documents have been successfully completed then organize them into a submittal package. If filing by mail you may pay the $25.00 fee with a check (made out to Secretary of State). If you are uploading the submittal package, make sure they are one PDF file. You may pay with a credit card (Visa, MasterCard, Discover) or with an account number.